You don’t necessarily have to spend a lot of money to obtain a good bottle of wine. But at most stores you do need to know a lot—or at least engage in a lot of trail and error—to be able to distinguish the value vintages from the glorified bottles of grape fruit juice. Not so at the Wine Legacy. They’ve pretested all the wines they carry to insure each is a work of quality. (We’d like to know where we can apply for that job). 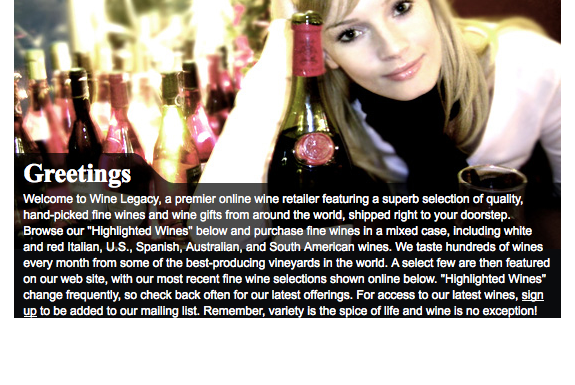 So all you need do is choose the grape type, region or price you’d like, read the detailed description of the bottles the Wine Legacy suggests and order the one(s) that fit your fancy knowing that you can’t make a bad choice at this win store. Cheers!